Home » india news » BJP MLAs seen eating during fast? Bharatiya Janata Party (BJP) Maharashtra MLAs Sanjay Bhegade and Bhimrao Tapkir were seen eating on Thursday, even as the party was observing a day-long fast. 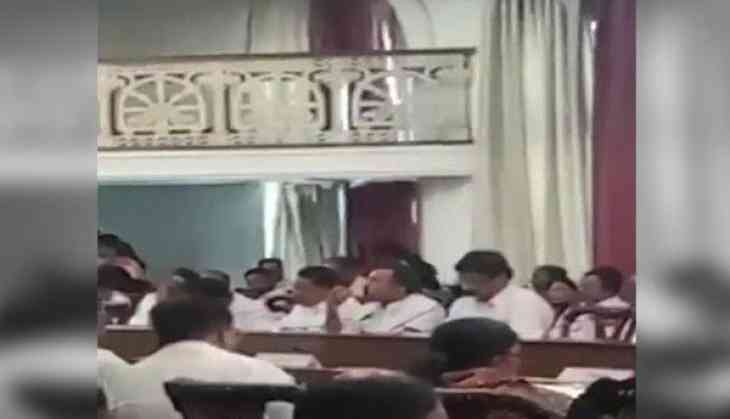 In a video clip that surfaced, the two MLAs were caught in the act during a meeting in Pune. Holding the opposition parties responsible for the Parliament washout in the second phase of the budget session, the BJP including Prime Minister Narendra Modi had observed a day-long fast on Thursday. It is notable that the BJP had called out Congress leader Arvinder Singh Lovely for eating before the day-long fast called by Delhi Congress on Monday, against atrocities on the Dalit community.